Discussion in 'Korean Martial Arts - General' started by Steven Lee, Jan 22, 2019. In 1934's reputable Korean newspaper, there's a sport called Yuk-ki breaking soft shingles (roof tiles) with fist strike. There are many reputable & old Korean newspaper records that show the derivations of the name Charyuk (like Yuk-ki) as well as the explicit name Kihapsul together. 400 years ago, there were many Korean history books all recording the same event of Korean Hand Breaking a large stone as big as a Soban table. Korean had martial arts (or Fight Game, pseudo-martial arts) like Subak which had frontal slap & punch like Taekkyeon (including Yetbub), Gwonbeop, Gitssaum (Flag Fight), Pyunssaum, Sibak. However, Breaking's strikes were created in the power circus Kihapsul/Kiaijutsu by trial & error trying with common sense strikes from everyday-life. The strikes improved; they started teaching what's already been created & improved (from common sense hitting, techniques are developed & more variety is added) including various hand shapes like Knife Hand. They teach the power circus (including Breaking's strikes) already created & improved without starting over the creation process at each generation. Strikes are learned by learning power circus including Breaking; martial arts were not involved. This is how Charyuk/Kihapsul/Kiaijutsu have worked in Korean society anyway regardless of how it was for some other sport which copied Kihapsul/Kiaijutsu. As for the difficulty of this creation process which some people object (they claim Breaking must have gotten its strikes from martial arts), the difficulty level is about the same whether people invent powerful strikes in martial arts then adopt them in Breaking or whether people invent powerful strikes in Breaking/Tameshiwari power circus. The process & the difficulty of creating powerful strikes are the same whether it's done for martial arts or for circus. In the early 20th century, Korean Kiaijutsu/Kihapsul was popular in Japan. Later in the middle 20th century, this Korean Breaking was formally adopted by Karate through Korean Mas Oyama including specific Korean traits like Yongryuk stacking speed, power, mass for strikes & pushing shoulder for hand strike. "Among Mas Oyama’s many accomplishments, he is perhaps best known for introducing tameshiwari or “stone breaking” into the practice of modern karate." Mas Oyama is also famous for using dogs & cows as a target of Breaking/Tameshiwari, which doesn't necessarily involve Karate for hitting or fighting animals. Breaking objects with strikes predates the introduction of karate in the 1920s. William Bankier, the strongman "Apollo", wrote about some Jiujitsu people breaking stone with hand strike his 1905 book "Jiu-Jitsu. What It Really Is". He also described how the heel or the side of hand was developed for this show. Before the time of Karate, Breaking/Tameshiwari already existed, but it was not related to striking martial arts but correlated with Qigong, circus performance art, wrestling. In 1940 the "Japanese American Courier" reported the Tacoma (judo) dojo holding its annual tournament Sunday afternoon at the Buddhist Church auditorium. Masato Tamura's rock breaking demonstration via the ancient Japanese art of "kiai jutsu" was shown. Tamura was a well known judoka in 1938 (third dan during Jigoro Kano's visit to America in 1938). Japanese Karate Breaking/Tameshiwari was not invented by Karate but existed before that as Korean Kihapsul/Kiaijutsu (also called Charyuk) & Mas Oyama (Choi). Kiaijutsu is pronounced as Kihapsul (also called Charyuk) in Korean by using the same 3 Chinese letters. Bob Hoffman, the founder of "Strength and Health" magazine, saw Japanese sidewalk performer performing Breaking before the time of Karate during World War 1. Such kind of sidewalk performance art (power circus, power magic show) is the Kihapsul/Kiaijutsu/Charyuk, which was the original Breaking/Tameshiwari predating Karate. Breaking/Tameshiwari originally had no relation to striking martial art. Strikes were created in the power circus by trial & error trying with common sense strikes from everyday-life to improve, then to teach what's already been created & improved (from common sense hitting, techniques are developed & more variety is added) including various hand shapes like Knife Hand. (No relation to striking martial art in concept nor techniques before the time of Karate.) Charyuk/Kihapsul Breaking typically uses everyday-life motions like headbutt, punching, Knife Hand (like massaging), stomping (no special kicking), etc rather than martial art exclusive motions such as roundhouse kick. After striking martial arts adopted Breaking/Tameshiwari from power circus, they added Breaking objects with more various moves which are not done in typical power circus Kihapsul/Kiaijutsu/Charyuk today or before. For hundreds of years, Korean has had a power circus (power magic show, power performance art) called Charyuk/Kihapsul which is pronounced Kiai-jutsu in Japanese for reading the same 3 Chinese letters in a different dialect. This predates Karate Breaking. Breaking Game already existed before Karate in the category of power circus performance art, not a part of striking martial art but correlating with wrestling, circus, Qigong (also called Kooksundo, Seonsul). Mas Oyama (Choi) introduced Breaking/Tameshiwari into the modern Karate culture. Karate also testified that Breaking/Tameshiwari is a form of personal trial like mountain climbing. "It isn't Karate, Kung Fu or Tae Kwon Do, but it is the same kind of personal trial that is Tameshiwari." In 1934's reputable Korean newspaper, there's a sport called Yukki breaking soft shingles (roof tiles) with fist strike. Breaking has been an activity in Korea for quite a while. Funakoshi may have introduced a new activity to Karate. The latter isn't conclusive, and neither provides direct evidence the latter comes from the former. I uploaded a new thread to Karate category. Maybe there are new proofs I didn't show you on this thread that I don't really remember. 1940's Japanese Breaking testified that Breaking/Tameshiwari was not Karate but Kiai-Jutsu/Kihapsul, which seems to be a solely Korean sport. Also, some Karate people did Breaking before Mas Oyama's era like in 1933. But it wasn't a regular culture or curriculum. Mas Oyama introduced Breaking to modern Karate as a common practice. I quoted Black Belt magazine & Kyokushin Karate. Also, Mas Oyama taught rotating shoulder for hand strike. Korea had that technique; Mas Oyama was a Korean; Karate didn't have that technique including in 1933's Karate Breaking. Also, Oyama taught stacking speed & power instead of implosion & explosion. Korea also had that technique; Karate didn't strike in that way. In any case, today's Karate's Hand Breaking/Tameshiwari uses traditional Korean strike techniques. Also, Karate adopted Breaking/Tameshiwari as a common practice because of Mas Oyama (not Funakoshi). Also, Japan was exposed to the culture of Tameshiwari from Korean Kiaijutsu. Funakoshi didn't add Breaking to Karate. Mas Oyama did in mid 20th century. Also, they got the idea of Breaking/Tameshiwari from Kiaijutsu. The question is whether Kiaijutsu is solely Korean or whether Japan also had it historically. The most important proof is 1940's testimony that Breaking/Tameshiwari is Kiaijutsu, not Karate. Many sports including Judo & Karate sometimes imitated Kiaijutsu's Breaking. Not because it is their curriculum and culture but by dabbling in Kiaijutsu. In 1933's Karate's Breaking, shoulders were stationary & square in his hand strike. In any case, Mas Oyama copied Korean hand strikes (rotating shoulder, stacking speed & power) into Karate's Tameshiwari/Breaking. Also, it's questionable whether Japan had Kiai-jutsu because they don't have it today. What happened to it if Japan also had had Kiaijutsu historically? Don't care nor mind my motivations. I obviously have hostility against Japan. But what's more important is that I don't want me, my background (Korea), Korea to share any credit nor lose any cultural historical wealth. I don't want to share Breaking nor its powerful strikes with Japan when Korea had had them already before Karate & Mas Oyama copied Korean striking techniques. (Today's Karate's Tameshiwari/Breaking uses hand strikes different from 1933's Karate Breaking's hand strike with square stationary shoulder not being rotated. The hand strike Mas Oyama taught Karate has Korean origin in Muyedobotongji Gwonbeop & Gitssaum Flag Fight.) Also, Japan got the idea of Breaking from Kiaijutsu which already existed before Mas Oyama introduced Breaking to Karate. "Among Mas Oyama’s many accomplishments, he is perhaps best known for introducing tameshiwari or “stone breaking” into the practice of modern karate." Focus on my scholarly sources & news organization sources that haven't been damaged in reputation. In academic standard, that means reputable. Don't focus on my motivations. Regardless of my motivations or your motivations or their motivations, facts are facts anyway. It's just a happy coincidence when what we want happens to be rightful. Meh...your research shows that "breaking" was NOT part of any martial art until Mas Oyama added it to karate demonstrations. Here is the problem. Mas Oyama was born in Korea and moved to China at a very early age, he studied chinese kempo at age 9 in China. He moved to Japan around age 15 and lived there the rest of his life. He changed his name to a Japanese name and was a citizen of Japan. He turned down Gen. Choi's offer to combine TKD and Kyokushin because of his life and roots in Japan and wanted to stay true to his karate roots. Mas Oyama was a showman and did tours in the US as a professional "wrestler". He took a street performer art and added it to his own karate for demonstration purposes and others did as well. You are trying to tie this in with Korean martial arts and there is no direct link until Oyama and ANY martial art. I would not call this "Korean" in origin since Oyama did not live and grow up in Korea, and always claimed Japan as his home. Iron Palm has also been a documented art for over 1500 years and includes breaking in it's practice. The breaking was a byproduct of the training, which was kept secret for many years. It wasn't really until the 1930's that more sifus started to showcase their art. For example, the famous picture of Gu Ru Zhang breaking around 12 bricks in 1932. You still have not shown that "breaking" came from Korean martial arts. Yes, Breaking/Tameshiwari was historically recorded to be Kiaijutsu/Kihapsul/Charyuk, which is a sidewalk performance art, not a striking martial art. Iron Palm is also not a Kung Fu; it's more Qigong. It doesn't have fighting moves, right? 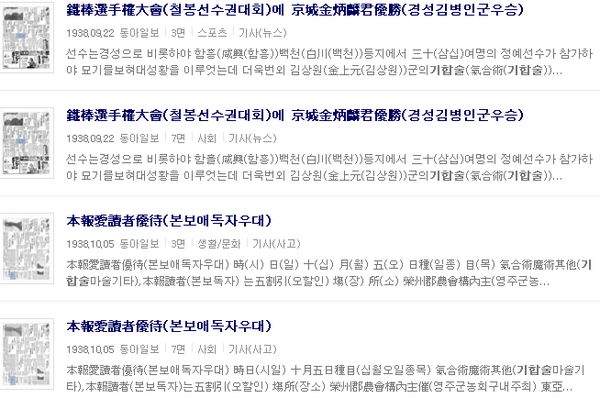 In old Korean newspapers 100 years ago, Kiaijutsu was correlated with Seonsul which means Taoist Qigong. It wasn't from Taekkyeon, Sibak, Gwonbeop or Subak. At least by the people's perception back then, Breaking was a form of circus. Also, 1933's Karate Breaking's hand strike was different from Oyama's Hand Breaking pictures. Shoulder not rotating vs shoulder rotating for hand strike, which was a Korean technique historically recorded in Gwonbeop & Flag Fight (Gitssaum). 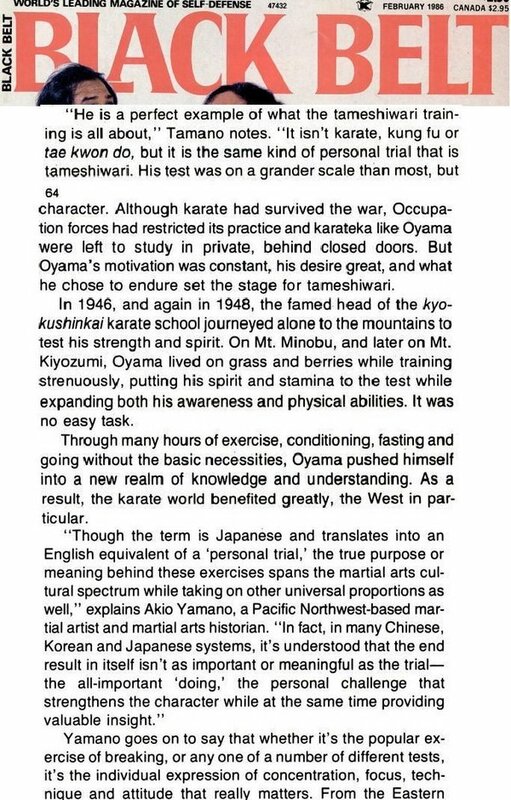 Mas Oyama showed detailed explanation of Chosun(Korean)-Gwonbeob in his book "1 million's Karate". He probably learned Korean Gwonbeop, not the original Chinese Gwonbeop/Quan-Fa/Chuan-Fa. Also, whether Mas Oyama himself learned any Korean martial art or not, Mas Oyama should be familiar with Korean martial art motions by seeing them in fighting games and Breaking/Tameshiwari street performance. You are saying that although Mas Oyama taught new hand striking techniques to Karate identical to Korean techniques historically recorded, Korea shouldn't be credited? Korea should share its traditional striking techniques with new (started by Kyokushin Karate, the strongest Karate) Karate? Why? Mas Oyama didn't have to learn Korean arts to know how those motions look like; it takes seeing them, not learning them. Also, Mas Oyama could have learned Korean Gwonbeop before or after he went to China. He became black belt in Gwonbeop on his second year in middle school. Did Chinese have black belt system back then? Probably learned Korean Gwonbeop. I said Korea didn't invent Breaking. 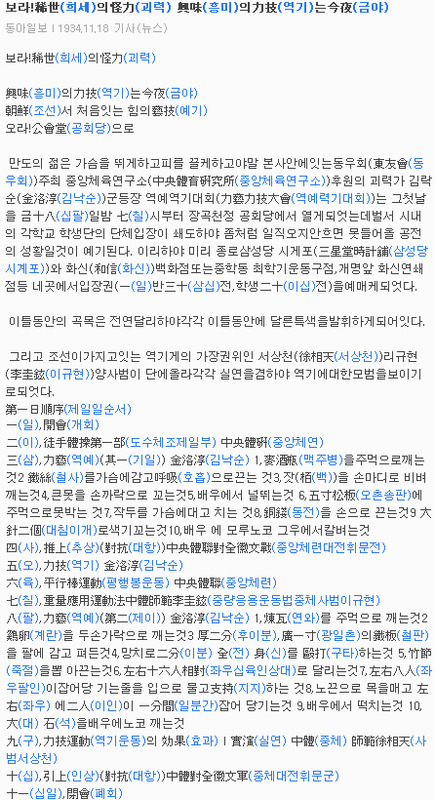 I said Japan became aware of Breaking via Korean Kiaijutsu/Kihapsul, not via China. 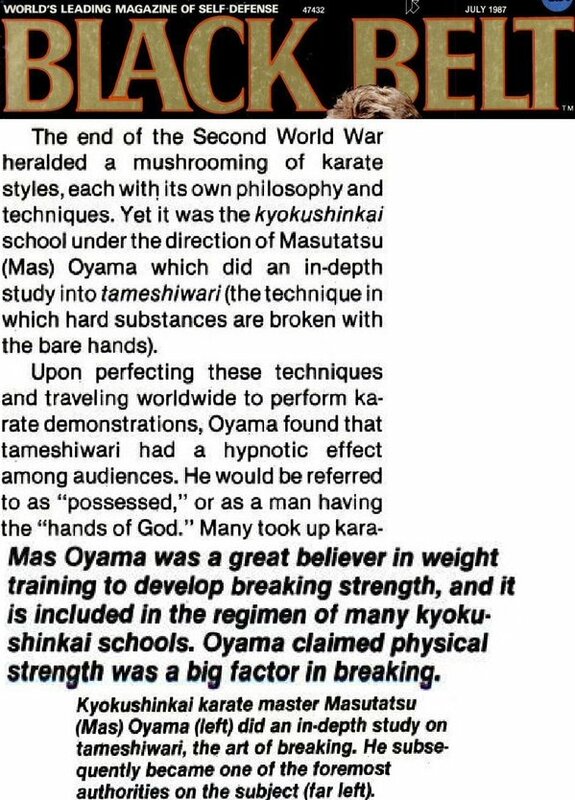 I also said Mas Oyama taught hand strike techniques not from Karate but from Korean arts. Korean arts were historically recorded to rotate shoulder and stack speed (& power) for hand strikes. In 1933's Karate Breaking's hand strike, the shoulders were square and stationary. Taekwondo is irrelevant. Taekwondo is a mix of Karate & Gwonbeop gyms (9 Gwans/gyms united for Taekwondo to start.) It's tainted cause of Karate. Korean has had other Fight Games like Taekkyeon which included punching in Yetbeob/Sibak/Nanjangbaksi. Even Subak had frontal slap and punches whether in Tagwon or in general Subak. Also, I'm saying Breaking is not from striking martial art but from power circus. It's just that the techniques correlate with the martial arts in the same ethnicity. One guy invents a technique, it spreads to all the sports in that ethnicity. Also, my contents get upgraded upon reputable counter-evidence and counter-logic. For example, before, I believed that Taekwondo had strictly Gwonbeop lineage. Now, I say it has both Karate & Gwonbeop lineage (9 Gwans united for Taekwondo in 1960's). I'm fine with "Japan and Korea both had Breaking Game; Korea had punching techniques with shoulder rotation; Japan copied this trait through Mas Oyama who introduced Breaking to Karate's modern practice as well as introducing new hand strike to Karate identical to the Korean hand strike". It's just that, I (& Korea) don't have to nor want to share credit when it's not deserved. That's why I'm pushing Japan got the idea of Breaking from Kiaijutsu. The question is whether Japan had Kiaijutsu in the medieval time. I saw some people claiming that Japan had Kiaijutsu although their focus was more on Kiai/Kihap rather than Breaking. I can't seem to find good references that Japan had Kiaijutsu in the medieval era. Also, aside from whether Japan also had had Kiaijutsu or not, Oyama's hand strike is identical to the Korean hand strike historically recorded in 3 references I showed. I don't want to share this strike. Korea deserves the full credit to that identical hand strike Mas Oyama (Korean) taught Karate's Tameshiwari/Breaking. Iron Palm is also not a Kung Fu; it's more Qigong. It doesn't have fighting moves, right? . Iron palm was trained by fighters to use in fights. It is not a qigong. Does Iron Palm have fighting moves? That's what I meant by it's more like Qigong. 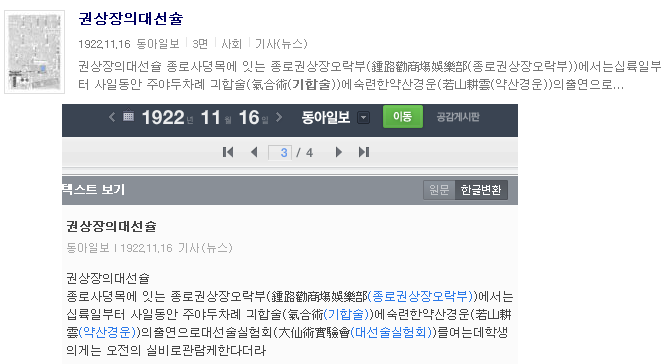 Also, Korean Kihapsul is historically recorded (I showed a newspaper screenshot) to correlate with Korean Qigong. And Kihapsul was historically recorded to do Breaking/Tameshiwari. Iron Palm isn't exactly a fighting art; it doesn't have fighting move. Also, Kung Fu didn't do Breaking in general. It wasn't a part of their culture & curriculum. Also, whether Kung Fu did Breaking in fighting arts or not, Korean did Breaking as circus Kihapsul. So did Japan. 1940's Judo Japanese black belt testified Breaking was Kiaijutsu to their perception. It wasn't Iron Palm nor Karate. Yes, Breaking/Tameshiwari was historically recorded to be Kiaijutsu/Kihapsul/Charyuk, which is a sidewalk performance art, not a striking martial art. Iron Palm is also not a Kung Fu; it's more Qigong. It doesn't have fighting moves, right? 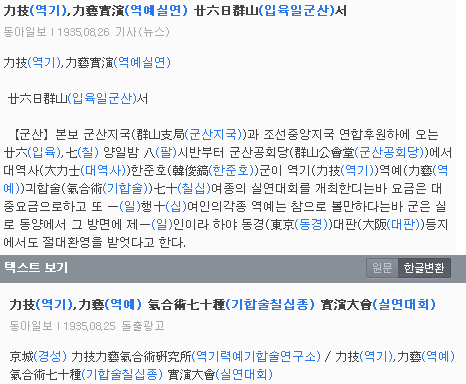 In old Korean newspapers 100 years ago, Kiaijutsu was correlated with Seonsul which means Taoist Qigong. It wasn't from Taekkyeon, Sibak, Gwonbeop or Subak. At least by the people's perception back then, Breaking was a form of circus. No, actually iron palm IS a kung fu (hard earned skill) and was one of the 72 consumate arts of Shaolin. Yes, it does have fighting moves and that was the whole purpose of iron palm, iron body etc. to train your body and hands as weapons. Since Oyama was in China when he was age 9 and Gwonbeop was the korean rendition of quanfa, it is reasonable to assume that he was learning the Chinese martial arts and not a Korean art while he was living in China. The illustrations of Oyama breaking objects and comparing it to how Koreans broke things and saying that those motions are not in Japanese karate are ridiculous. Those motions are ALL in the chinese arts and in Goju-Ryu that he also studied. Again, there is no direct link that Koreans were the sole source of this. Did you read punisher73's post? Unless Chinese Quan Fa had Dan system (Oyama became first dan at the second year of middle school), Oyama probably learned Korean Gwonbeob. Also, the point stands. Oyama don't have to learn Korean arts to know how they look like. He must have seen them at some point of time instead of creating a hand strike with shoulder rotation just like the Korean way by coincidence. Jumping rope can be a part of fighting systems, that doesn't really make it "fighting". Iron Palm is more of a training whether we call it Qigong or not. Also, Korean Kihapsul was recorded to correlate with Seonsul (Kooksundo, Korean Taoist Qigong) regardless of Iron Palm's nature. Also, Kooksundo (Seonsul) also moves body a lot; it's not stationary. I haven't seen a Kung Fu style that rotates shoulder when punching. Also, shouldn't Karate be consistent? If Goju-ryu Karate rotates shoulder when punching from the start of that school without learning it from Kyokushin Karate, how come other Karate schools particularly Shotokan Karate don't do it? The important point is that Korean Kihapsul/Kiaijutsu was already well known and seen in Japan at the time. They have seen Koreans do it. If Mas Oyama has seen Koreans do it then copy it afterward, Korea should be credited. Do stances have fighting moves? You actually read all that stuff? The sports or arts teaching stances also teach strikes. Iron Palm is a complete art by itself, isn't it? Also, how is it relevant whether Iron Palm is a fighting art or not? Kung Fu doesn't have Breaking in its culture & regular curriculum. Breaking's the culture of power circus & Iron Palm. Whether Kung Fu also trains Iron Palm or not, it's a separate culture within Iron Palm. As for Japan & Korea, Breaking wasn't about Iron Palm but Kiaijutsu/Kihapsul (Kihap/Kiai Techniques). I'd appreciate if you read everything I wrote including the references. Then you can agree or provide counter-evidence. I don't need regular people. I'm just reaching out to objective people and scholars (historians). Also, it wasn't Funakoshi but Mas Oyama that introduced Breaking to modern practice of Karate. That included a new strike identical to traditional Korean hand strike (shoulder rotation in Gwonbeop & Flag Fight Gitssaum punches, Ikmyung Yang's Hand Breaking also mentions Yong stacking speed & power). Before Mas Oyama, Karate didn't emphasize playing Breaking/Tameshiwari. Also, it was Kihapsul/Kiaijutsu that was doing Breaking/Tameshiwari. As far as I know, the arts teaching Iron Palm also teach strikes - it's part of the point of Iron Palm. In the past, your definition of "objective" was "agrees with my conclusion".